“ FAMILY JEWEL” shows like a brand new vessel. Her owner is an avid yachtsman, yachting for 60 plus years. FAMILY JEWEL boasts a very tasteful and comfortable salon with satin finished designed interior. If you are entertaining, or just having that elusive family time, this vessel affords the space and comforts for both. The multi television set up in the salon is a sports fanatics dream, watching playoff games or the Super Bowl, this is the place to be. This vessel is maintained by a full time captain and crew. No expense was spared when it comes to maintenance and safety of this vessel. 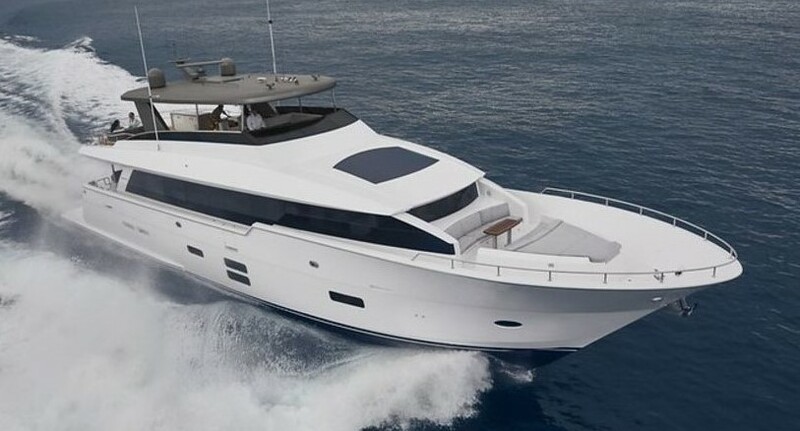 The Hatteras is a world class design of the 80' motor yacht and one of the most popular vessels that Hatteras has ever built, coupled with an owner who is a true yachtsman that has owned multiple Hatteras yachts, it makes this vessel one to see! Entire vessel chilled water line insulation checked and replaced as needed. Both A/C raw water pumps rebuilt. / New spare pump. Davit fully serviced, hoses replaced, rams and slewing motor rebuilt, cable replaced and load tested (May 2018). Bottom job, 2 coats of bottom paint, prop speed on all running gear, spur line cutters installed, both props pulled and tuned to class (May 2018). Complete vessel Masthead to Waterline professionally polished and waxed (June 2018). Caterpillar 2000 hour serviced performed including transmission and oil change. All Safety equipment up to date, including life raft repack and fire system inspection (December 2018). GP Link monitoring system on board for main engines, fire and high water.